luxurious backyard, either one will ensure a vacation to remember. pristine canal views. Nature will come to you. With professionally maintained lawns and serviced pool, your canal front home boasts comfort and picturesque views not only from the master bedroom but also the large living room, dining room and guest bedroom now that's relaxation. The poolside area is comfortably furnished with patio furniture. Banana River and close to Cape Canaveral locks for access to the Atlantic. We are coming back, that says it all. The house is beautiful, it has a view of the canal from the entire south side. The house was very clean and is well kept. We loved it! We had a wonderful stay, home has everything!! The home is conveniently located to everything, the beach is close enough to walk or a very short drive, in the evenings you can even hear the surf. Very quiet location, always some tropical birds in the yard or on the dock. Everyone had a great time and enjoyed the backyard views. Such a relaxing and beautiful home. All you need to have a fantastic holiday! Highly recommend this rental. Fishing off the dock, sunsets and cozy welcoming home. You won’t be disappointed!! Close to Cocoa beach, shops and restaurants. Owners are friendly and accommodating. The pool is perfect after a long day exploring around. We will be back!! The canal views were gorgeous. We loved kayaking through the canals and watching the sun set. The beach was a short 15 minute walk away. The home was spacious and stayed cool in the hot August weather Our family had a very relaxing time! 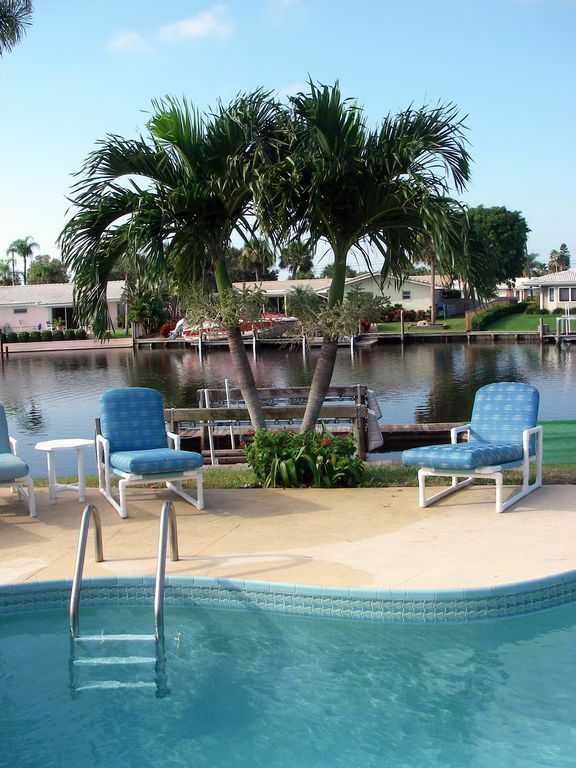 We have been vacationing in Cocoa Beach for many years and have enjoyed several properties in the past. This is the first year we decided to go riverside and it proved to be a great choice. The house was everything we could ask for and was stocked with all the necessities. The pool and seating area provided the entertainment/relaxation for our family with a great view of the river and all the wildlife that calls the area home. Although the property is not directly on the beach, it is well worth the short walk/drive to Lori Wilson Park that has plenty of parking, showers, and baths for your beach day. This house offered the room, the pool, the view, and the atmosphere for a family retreat at a great price and in a great area! Thanks and enjoy.